Pi Hard, with a vengeance! Robots, Arduino, PcDuino and the Raspberry Pi! Some hardware hacks from my home shop with bits and pieces from 3D printers! Hack 4.3 inch tft display to run on the Raspberry Pi's 5v DC supply! 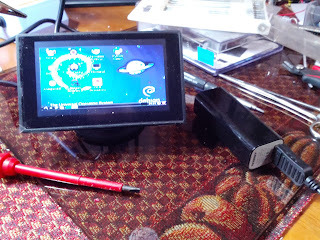 I purchased one of the inexpensive 4.3 inch tft lcd display to use with my Raspberry Pi/Robot. 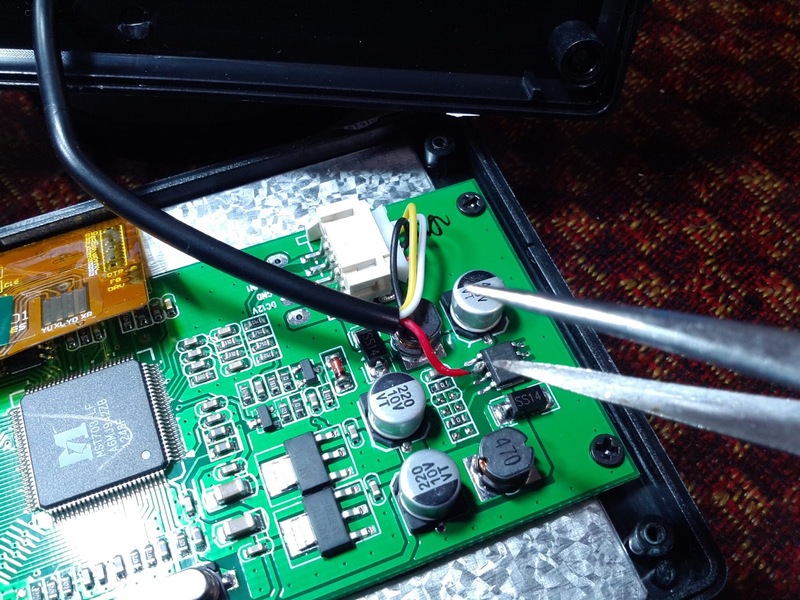 It is set up for 12v DC Automobile voltage, but the hardware can be hacked to run on 5v DC power. The same power as the USB input on the Raspberry Pi and the logic supply on my motor controller. I did a search and found instructions for other displays, but not for the specific one I had purchased. No brand name on the packaging. It is model number BWCMO363 and is titled " 4.3'' Color TFT Car Monitor Support 480 x 272 Resolution + Car/Automobile Rear-view System Mirror Display Monitor" on Amazon that uses the xl1509-5.0 voltage regulator. Note: do not do any of the following unless you are familiar with electronic components and comfortable with the procedures described. 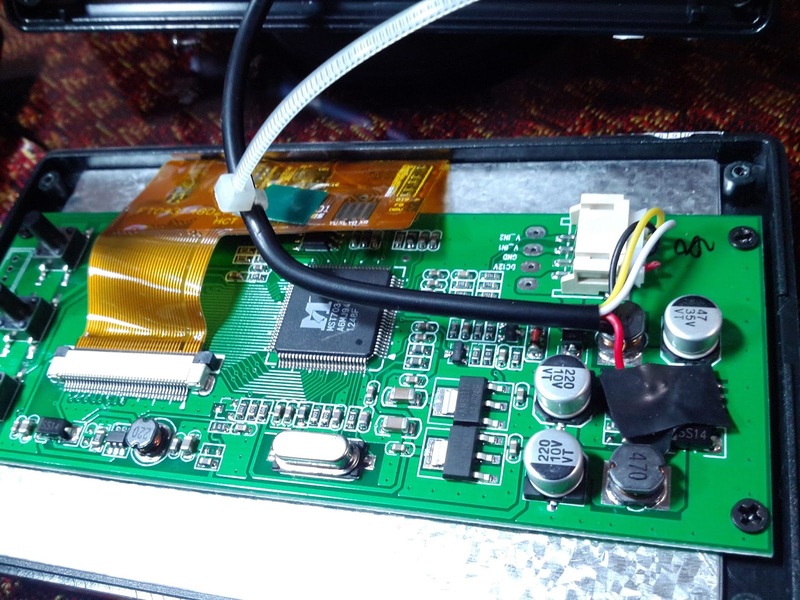 Altering the components can damage or destroy your display. I found the data sheet and confirmed that pin 2 was the 5v out. Unlike other instructions, I just want to change the power requirements from 12v to 5v. I am not swapping in a USB cable or any other mods, so it is not necessary to unsolder the voltage regulator chip or even disconnect any other wires except the 12v + Red wire. We do not need to disconnect the ground since I am using this cable's Black/ground wire. (xl1509-5.0 located center, far right on the circuit board. This second photo you can see that I moved the red wire from the cable connector on the breadboard. I moved it over to pin 2 of the xl1509-5.0 voltage regulator and carefully soldered it to the pin 2 leg. Since there is no longer a voltage in feed, the regulator should be dormant and does not need to be removed or altered. This is my first solder attempt with surface mount components. As you can see i n the photo above, this is a very fragile procedure. I am pointing with needle nose tweezers! My tip of the soldering iron covers at least 2 legs of the voltage regulator. So just be prepared! Since I left a long lead on the wire (less than a 1/8th inch) exposed, I put electrical tape above and below the wire to insulate it. Also, there is no strain relief for the input wires. (Solder is the only thing keeping it connected to the monitor!) I used a zip-tie, tightened around the wire inside the case. Cut off the tail and when it is closed up, the cable will snap before the solder joint comes under any stress. 4.3'' Color TFT Car Monitor Support 480 x 272 Resolution + Car/Automobile Rear-view System Mirror Display Monitor on Amazon. Note from the reviews: the model number stays the same, packaging and design (menu buttons) do change. Could I feed the 5V from the GPIO? I don't think it would be advisable. The raspberry pi has a 1100mA polyfuse on it's power supply input. During normal runningg it is only pulling 700mA and will trip the fuse if you attempt to pull more than 1100mA/1.1 amps. 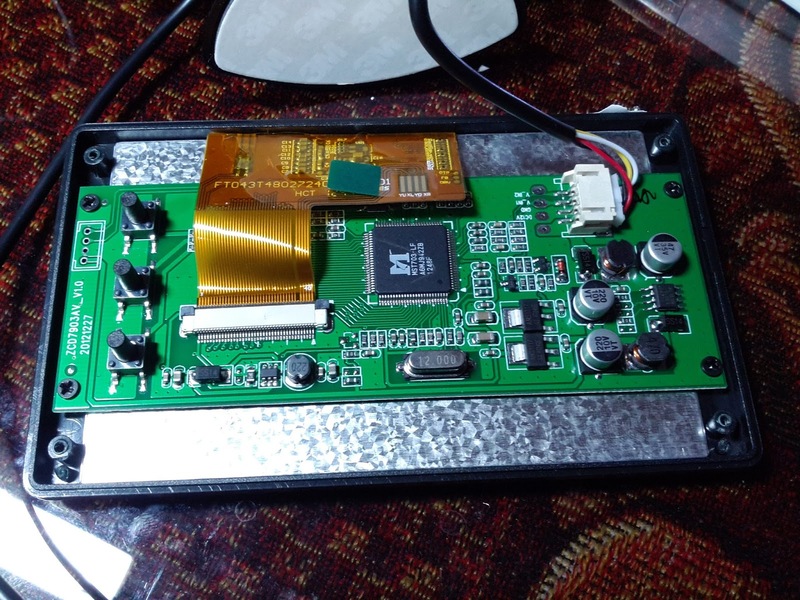 If you attempt to use a couple of power hungry usb devices without external power, you will see the effect of too little current. The tv screen itself would probably draw more than an amp alone. I'm not sure of its power consumption, but it is probably safe to assume it will require it's own power feed. The good side is that the screen and the rpi can run on 5 volts. 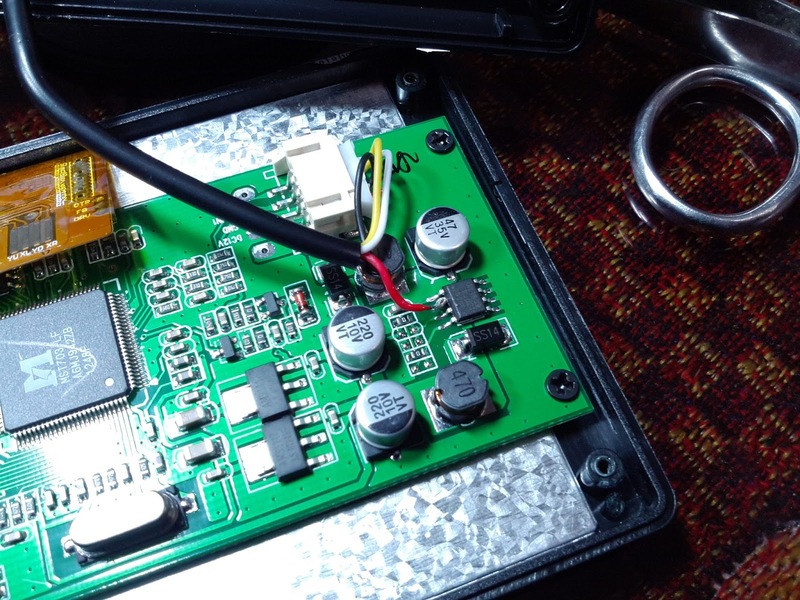 Use a 12v power supply and a 5v power regulator and you should be able to run them both from the same power supply/battery. 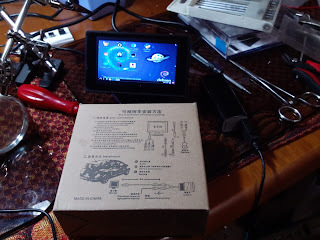 I just got a similar TFT display. It says that it supports both NTSC/PAL videos. When i connect a NTSC out camera module to this display, i couldn't get any output in the display. On the other hand i could get the PAL display output. Is there any hardware changes to be done to display the NTSC signal. Keep updated, Subscribe To PiHard! Repair Terminals on Hobby DC Motors. Assembled the k8055 USB controller board! Any questions on anything, be sure to leave a comment! ALL PHOTOS, DRAWINGS AND ARTICLES (C) 2013-2017 ED BAKER, NO USE WITHOUT PERMISSION AND ATTRIBUTION. Awesome Inc. theme. Powered by Blogger.